News from the HIT digital forest… and life in general. 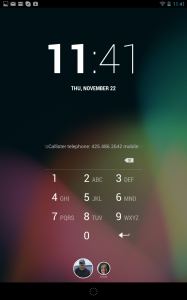 Android 4.2: A Major “Minor” update…. I am a daily user of the current versions of iOS (on an iPad) and Android (on a Nexus 7 tablet.) The newest version of Android, the 4.2 update to Android Jelly Bean, has been described as a “minor” update — not even worthy of a new dessert/confection nickname! But it includes several significant features, including THE most basic feature missing on both iOS and Android until now. Most reviews of 4.2 I’ve seen have focused on features like the camera app, Google Now, or Gesture Typing. I do like them but they’re mostly notable in comparison to competing products (i.e., PhotoSphere vs. iOS’s panoramas, Gesture Typing vs. Swype.) They are either feature-matching or one-upmanship. The basic problem Android 4.2 solves is tablet sharing. Smartphones, by their very nature as personal communicators, and less likely to be shared. Tablets, on the other hand, in many families will be shared devices. And who wants to pass over to their teenager the keys to their work email account? Or, trust issues aside, wouldn’t it be nice for you and your significant other to be able to BOTH access your email, work email, browser favorites, and other apps and preferences? Maybe without spending several hundred dollars for a separate device for each person in the house…. Native multiple user accounts — like you’ve had for, well, a couple of decades on your desktop computer. has a profile photo, with the selected profile being larger. In Android 4.2 Google has delivered this and in its first release has done a decent job implementing it. Adding a user is easy, and if you can see at any time whose account you are using by opening the Quick Settings panel (swipe from the upper right of the screen), without having to go through multiple touches or screens. When you create a new user, they have their own screens, initially the default Android home screen, not a duplicate of the screens and apps of the other user(s). However, add an app that is already on the tablet and it will instantly “install” without a download and seems to have very little overhead on the tablet’s storage. 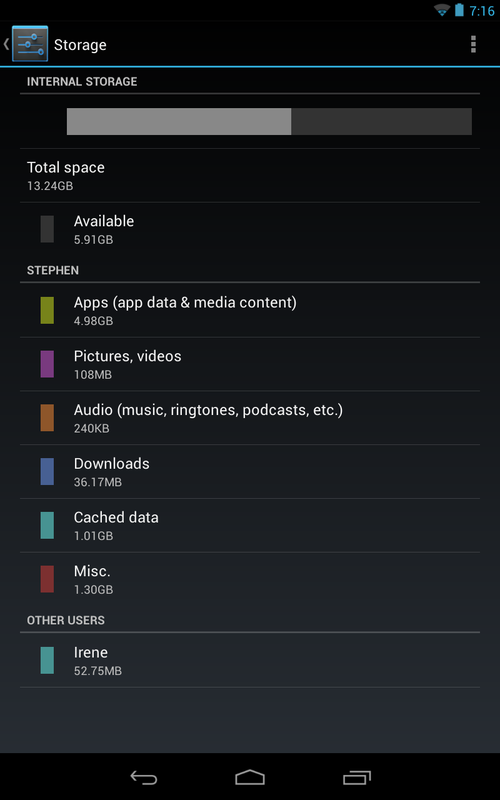 Overall storage usage will depend on how much media, email, etc. the user has, but on my Nexus 7, adding an account and email for my wife only used about 50 megs additonal space (see below). You also have the range of security settings available, so that each user can keep their account secure. You could also, of course, create separate “users” for your work and home life. This is a turning point in the evolution of tablets. The next step will be to super-size that “personalization” of the tablet to an entirely virtualized environment. Soon, you will be able to walk into a restaurant, office, or hotel and login and access all your apps and personal data just as securely as if on a device you own. That is certainly a ways off, but probably not as far as we would think. 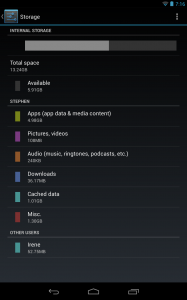 For now, it’s great that Android 4.2 is bringing the first step on the journey, tablet sharing. For couples and families this somewhat unheralded feature of a “minor” release is useful, welcome, and, frankly, overdue. Star Wars: The Last Jedi…. ALL SPOILERS all the time! 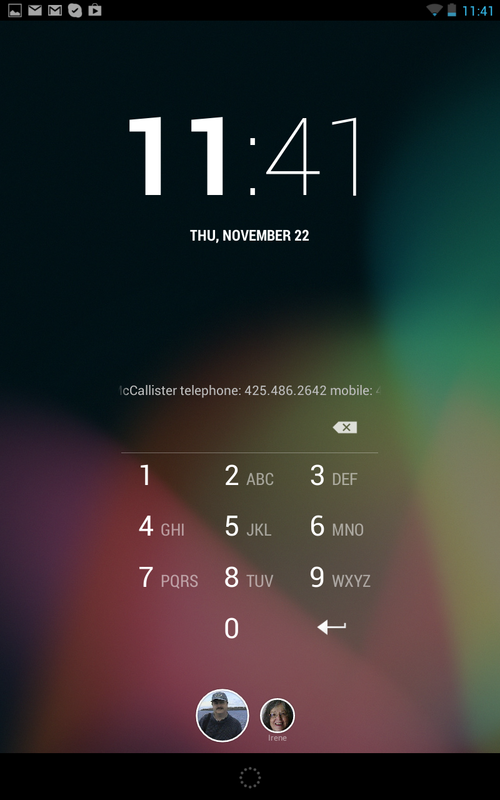 Project Fi Review: Love It!